F. Scott Fitzgerald wrote: "Let me tell you about the very rich. They are different from you and me." He was right: The rich get better returns on investment. The Harvard endowment rose 21.4% to $32 billion in the university's fiscal year, which ended on June 30. 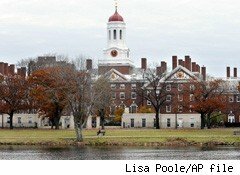 Harvard has the largest endowment of any university in America. The Harvard Management Company wrote, "Over the past two decades the average annual return on the endowment has been a robust 12.9%." Those are Warren Buffett-class returns, and the management company crowed about how well it has done in volatile markets. That may be true, but the fund is still a bit shy of its peak level in 2007. The drop in the endowment that accompanied the fiscal crisis' stock market collapse forced Harvard to trim staff and curtail some activities. The best performing part of the endowment was its investment in domestic equities, with a return of 34.6%. Investments in private equity funds also did well. But as endowment officials looked forward, they expressed concerns about market conditions. "Since the end of the fiscal year the markets have been exceptionally volatile, driven by concern and uncertainty related to the debt ceiling debate, the fate of the eurozone, the S&P downgrade of the U.S. Treasury securities, and indications of slowing growth in economies at home and abroad. The impact of these issues on our portfolio is unavoidable." Harvard has a secret weapon when it comes to the size of its endowment: It has some tremendously rich and generous alumni. Harvard offers a number of ways for the wealthy to give the university money, and those include ways they can make gifts and collect the returns on those gifts for the rest of their lives. Harvard has, in order to get the most from its graduates, become a wealth management machine. Harvard is at or near the top of most rankings of universities. The most important contributor to those rankings may be its unprecedented access to that huge endowment, which allows it to hire the most talented faculty and give them tools available almost nowhere else.